900 square feet of perfection. 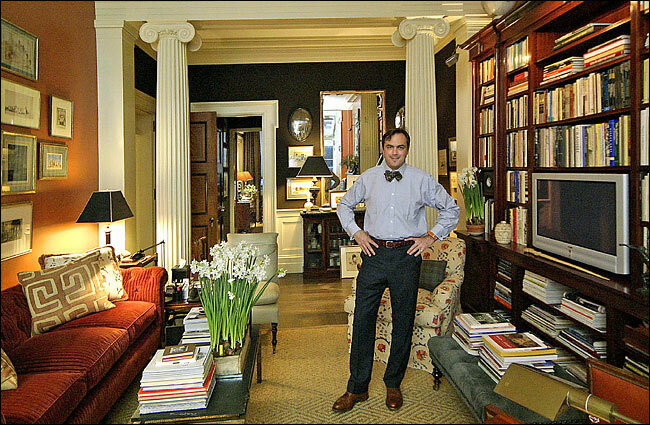 Architect Gil Schafer meticulously designed every square inch of his historic Greenwich Village parlor floor-through, resulting in a space that sensitively conserves (or replicates) many of its original 1830s Classical details AND accommodates all the necessities of 21st century comfort. This gorgeous burnt orange color was also used in Schafer's country house - I wonder if he wanted to create a sense of continuity between the two residences or just loves the color? I am always curious to see the homes of designers - with no client demands to conform to, they can really let themselves go. It is clear that Schafer, who has done much for the Institute of Classical Architecture, walks the talk. Together with decorator Miles Redd (who also worked on Schafer's country house) and a crew of talented craftsmen, Schafer has created a mini-Palladian mansion in the tradition of English aesthetes Lord Burlington and William Kent, chock-a-block with prints, drawings and curiousities worthy of the Grand Tour. AND I adore that Schafer's TV is out in the open - why apologize for it? Click here to read more about how Schafer ingeniously reconfigured the layout and how he handled having 13' ceilings which gave him more wall space than floor space.